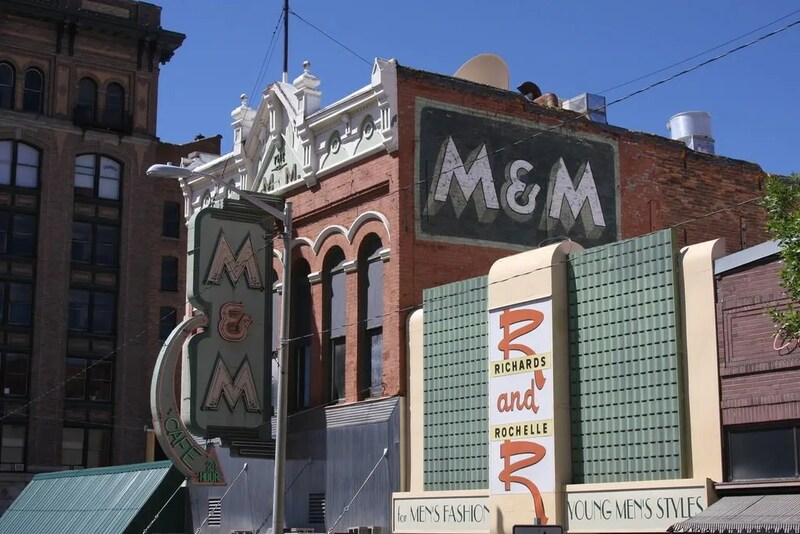 According to the Butte city webpage, the M+M has been open since 1890. It is half lunch counter and half bar, the bar being the counter on your left as you walk in, the lunch counter being the one on your right. In the back is gaming. Food at the cafe is excellent, and as it is cooked behind the counter, you get a show as you wait. The stools are a type I have never seen before, with a vertical “twist” ripple to their top. The cafe logo is embossed in their seat covers. We were in Butte, working the National Folk Festival, and hit up the cafe twice, once during the three day festival, and once a day after. While the event was in town, the M&M was standing room only. It was so full and swamped that we gave up. The second time was different, slower, once the festival had left town, and it was back to mostly locals. I love the juxtaposition of the M&M and the R&R. The Neon, the hand painted sign on the side of the building and the lettering in the trimwork up top all proudly announce the name of the cafe. The stainless facade adds some sparkle to the old brick building. The current neon was added sometime after 1939. A different piece is found in this 1939 picture of the cafe on Shorpy. The town doesn’t look all that different, though than it did 70 odd years ago. This entry was posted in Diners / roadside related, Diners/ restaurants, Roadside attraction and tagged Big Sky, Butte, Butte Montana, Butte MT, diner, Lunch Counter, M&M Cafe, M&M cigar, Mining, Montana, MT, National Council for the Traditional Arts, National Folk Festival, West, Western by Spencer Stewart. Bookmark the permalink. I was reading your review, I wish that you would of been able to sample the flavor before it was closed the first time. I grew up in uptown Butte, my parents as well as my grandparents brought me up there to eat at least once to twice a week. Ground Rounds and Fries with made from scratch brown gravy. YUMMMY! This restaurant rocks! They have the best burgers (I like American or Cheddar Cheese on mine.) They also have a huge, and I mean huge ham steak they bring with the ham and eggs that my husband can eat, although he usually brings some home to the kitty cats or the dawgs. Sam at the bar is a sweetheart and we love him–he is always so nice to my mom, age 91. 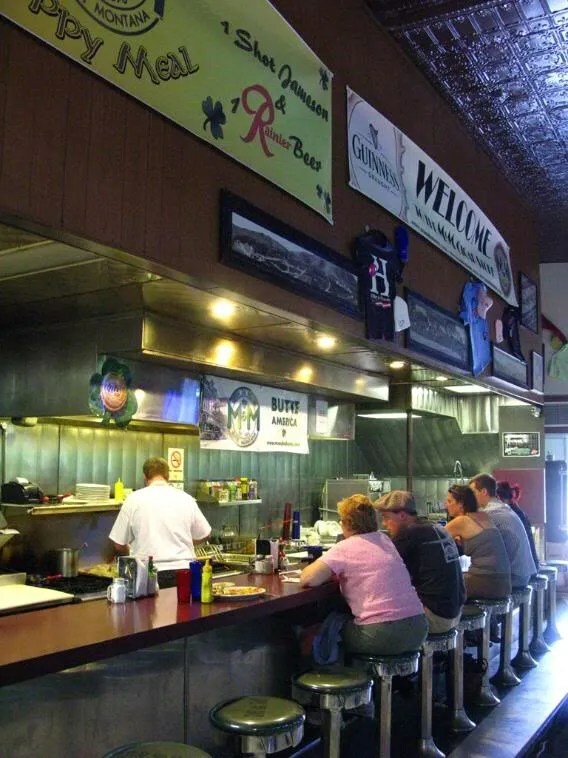 She remembers this bar and restaurant back when she used to teach at Butte High in the 1950s. How could you not love it. Also, I love it because I won at the off-track betting a couple weeks ago and me and the hub have gone to the movies a couple of times on that win. Thanks, M & M! Watching the movie Don’t Come Knocking and having sudden urge to visit Butte, eat at M&M. M and M-Always our (Dave, Bob, and Jim) first stop before heading to Divide to flyfish the Big Hole. Loved their pork chop sandwich.